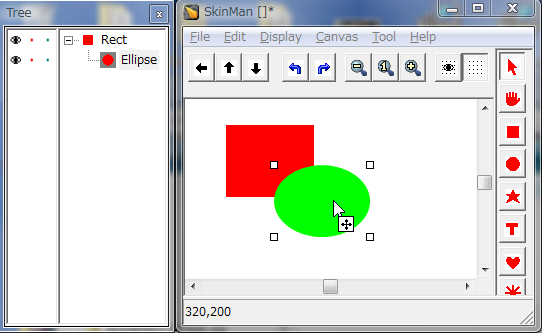 SkinMan consist of four windows. Main window: The canvas and drawing tools. Tree window: The list of all primitives. parent-child relationship and foreground-background relationship. Properties window: parameters for the current selected primitive. 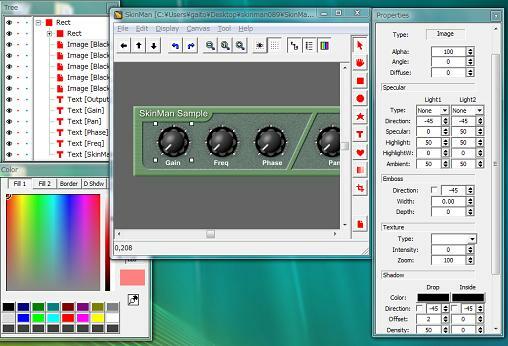 you can tune these parameters to you want, including color / shape controls / lighting / embossing / shadowing. Color window: The colors for current selected primitive. One primitive has five colors (Fill1 / Fill2(for gradation) / Border / DropShadow / InsideShadow). Each window (except for main) can be hidden by F5 / F6 / F7 keys. In the Tree window, each primitive can be moved to other position by Drag&Drop. If the target shows the Insert-line between items, dragging primitive wil be inserted to the position. If no Insert-line is displayed, the dragging primitive will be a child item of the target. Child item will join to the group of the parent that will be processed as a group for position-move / delete / copy / paste and visibility control. If you select child item's "Operation" parameter to "Shape+" or "Shape-", that affect the logical shape add / subtract operation to parent item. 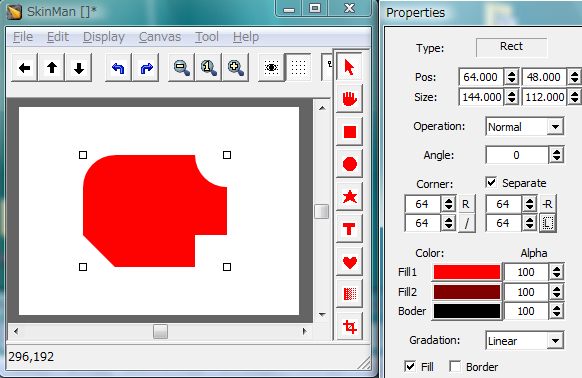 you can make a multiple selection by Shift+Click the item, or drag the area on the Canvas or Tree-view. Even if the parent primitive is selected, children primitives still remain non-selected. children accompany parent about move/resize/delete/etc but except for Align/Distribution. Selected primitives are displayed by gray background icon in the tree-view. just clicking the overlayed position with L-button (without dragging) will change focus in order of front to back. especially, the first click from no item on that position is selected, will select the top most primitive. White square handles are displayed by single primitive selection. Black square handles are displayed by multiple primitives selection. the multiple primitives selection is made by shift+click, area-dragging, or a selection of a primitive that has child. In this case, by pressing 'Ctrl' or 'Shift' key, Black handles (group) and White handles (parent primitive only) are both displayed. Only the parent primitive be resized by dragging white handles. (R): Select Rect tool. return to Arrow after create a Rect. (Shift+R): Select Rect tool. will not return to Arrow. 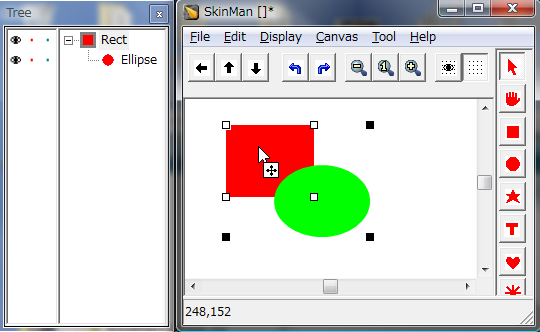 (E): Select Ellipse tool. return to Arrow after create a Ellipse. (Shift+E): Select Ellipse tool. will not return to Arrow. (P): Select Polygon tool. return to Arrow after create a Polygon. (Shift+P): Select Polygon tool. will not return to Arrow. (T): Select Text tool. return to Arrow after create a Text. (L): Select Lines tool. return to Arrow after create Lines. (Shift+L): Select Lines tool. will not return to Arrow. 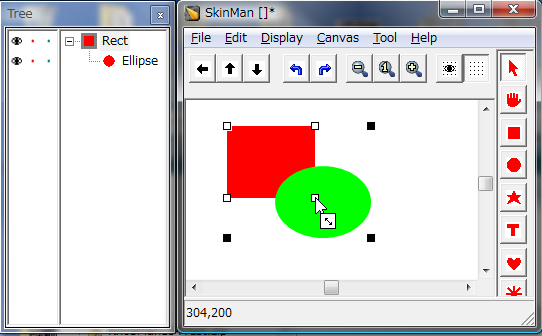 SkinMan has Corner shape options for rectangle's each corners. In default, the first corner parameter will be applied to all four corners. If you check the "Separate" checkbox, all four corner can be controlled individually. 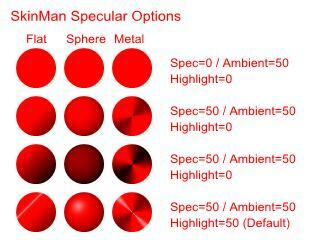 SkinMan has three types of specular options for each primitive. Flat, Sphere and Metal.